Jewels is our smaller standard girl. She is about 45 lbs. She will produce black and white Sheepadoodles with a soft wavy coat. Her puppies have a higher chance of holding the black and white colouring because of her dark red gene. Jewels is a sweetheart who will soak in attention from anyone! 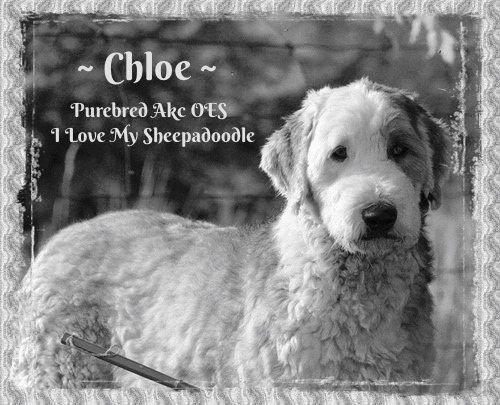 She will make friendly, playful Sheepadoodles in either the Moyen or Standard sizes ranging from 40 – 60 lbs. CKC Registered, OFA Hips and Elbows Good, Carries Cu/Cuc coat test. Missy is a larger standard girl. She weighs in at about 55 lbs. She has a quiet, calm demeanour and takes life in stride. She should produce some nice pups!! She has a lovely thick coat with lots of curls! 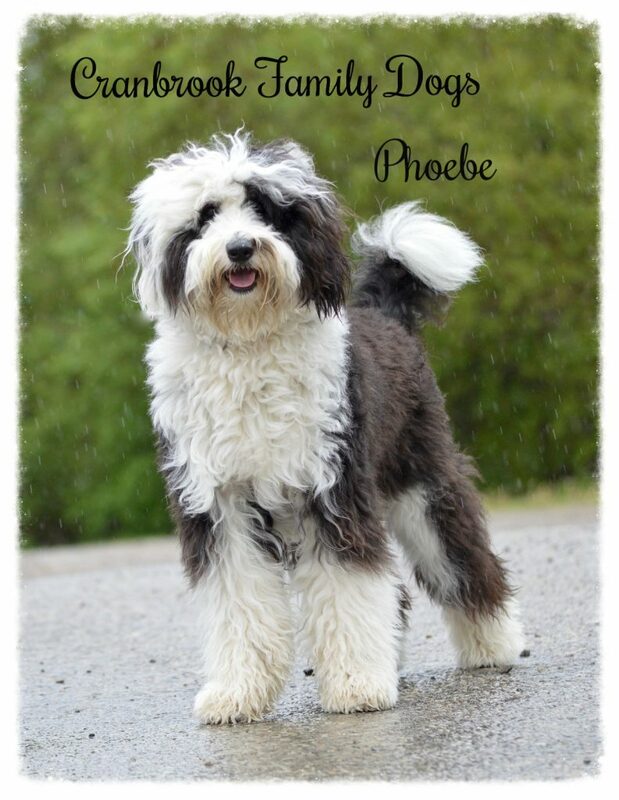 Her Sheepadoodle puppies will likely have wavy coats that have little chance of shedding. Since she carries Phantom, Sable and Brindle and brown, she will offer some nice color markings in her offspring. Missy is kind and gentle, yet still outgoing. She will make well rounded pups with thick full coats in either the Moyen or Standard Sheepadoodle sizes ranging from 45- 60 lbs. Piper is our sweet, gentle girl. She has a soft curly coat and weighs in at 38 lbs. Piper has a winsome personality! She is great with people and other dogs. She is so easy going and is non alpha type. She is registered with the American Kennel Club. We look forward to some amazing Moyen Sheepadoodle pups! 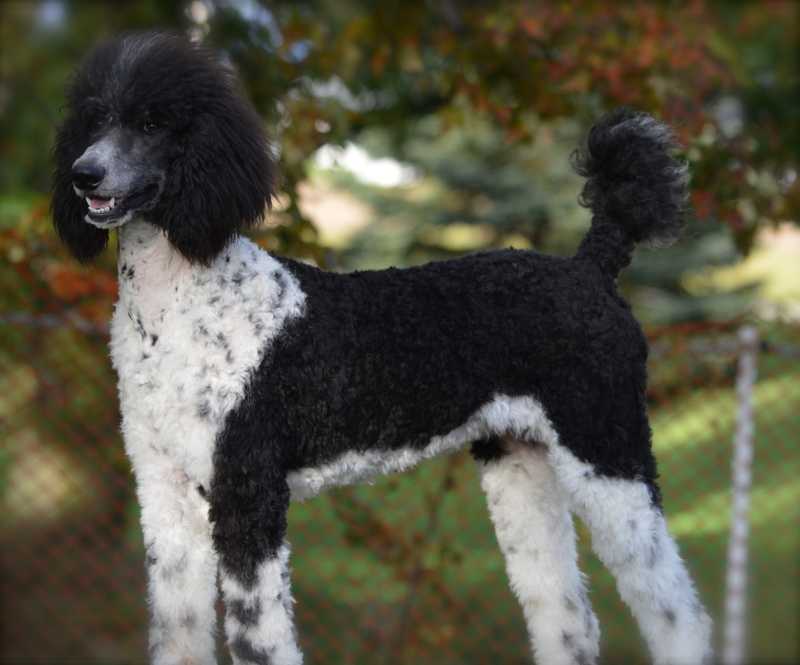 Marlin is our striking black and white standard poodle. He weighs in at 50 lbs. 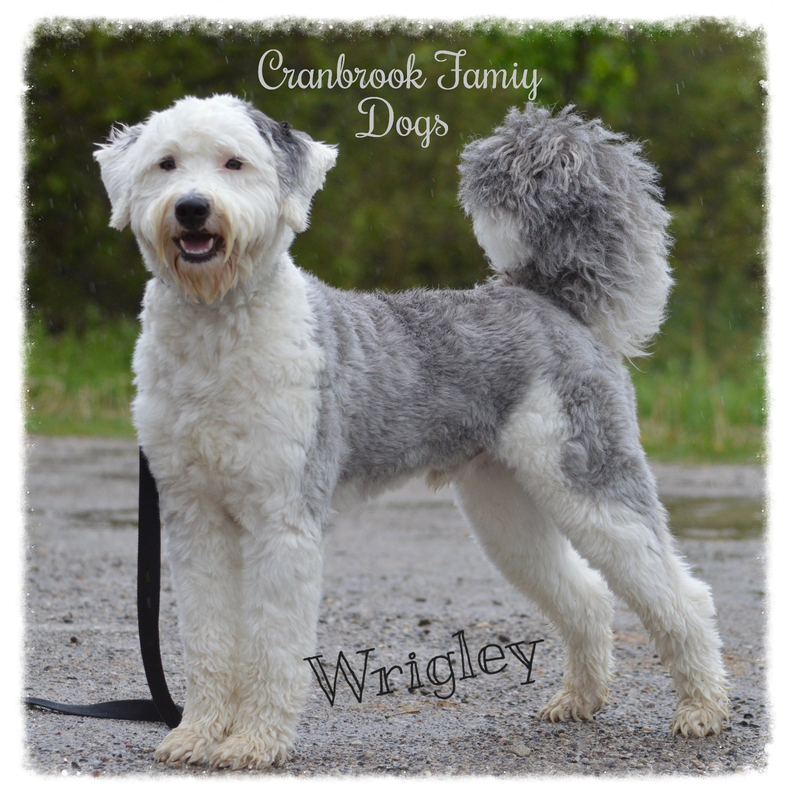 He is registered with the Canadian Kennel Club. He has passed his hips and elbows tests. 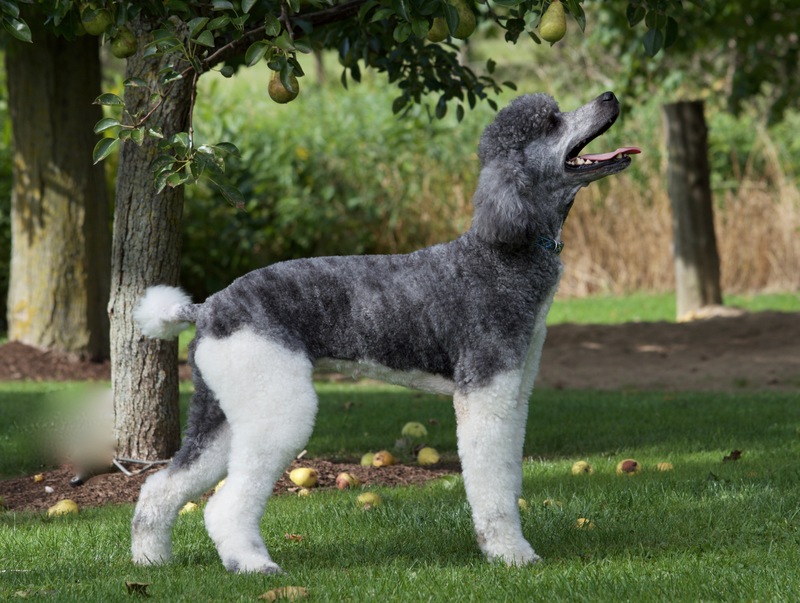 He is a prancy boy – a true poodle! He is also very loyal and stays close by to his owner. He has a soft coat with a gentle curl to it. He will make some stunning Standard Sheepadoodles in our program! 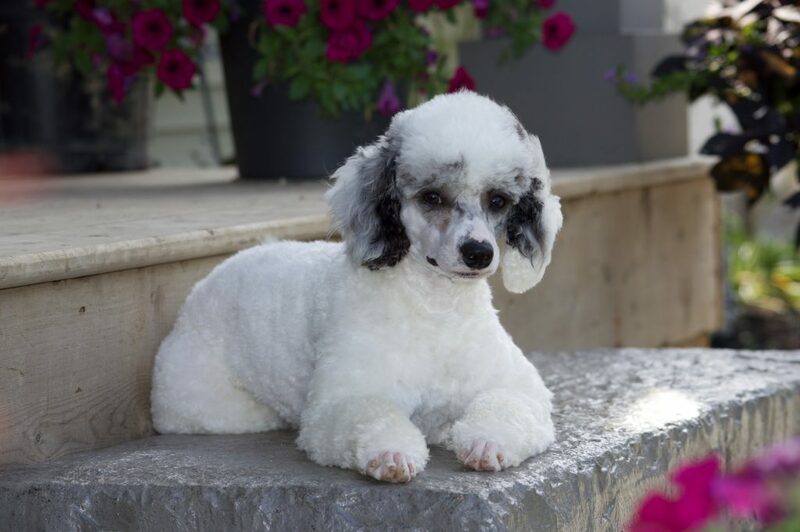 King is our newest Standard Apricot and White Parti Poodle. He is registered with the Canadian Kennel Club and has passed his health tests – OFA Hips Fair, Elbows Normal, OFA Heart certificate clear. He is a tall, regal boy and will throw some bigger Standard Sheepadoodles for us. He carries a straight coat gene so we expect wavy coats from his litters. He has a quiet, calm personality. 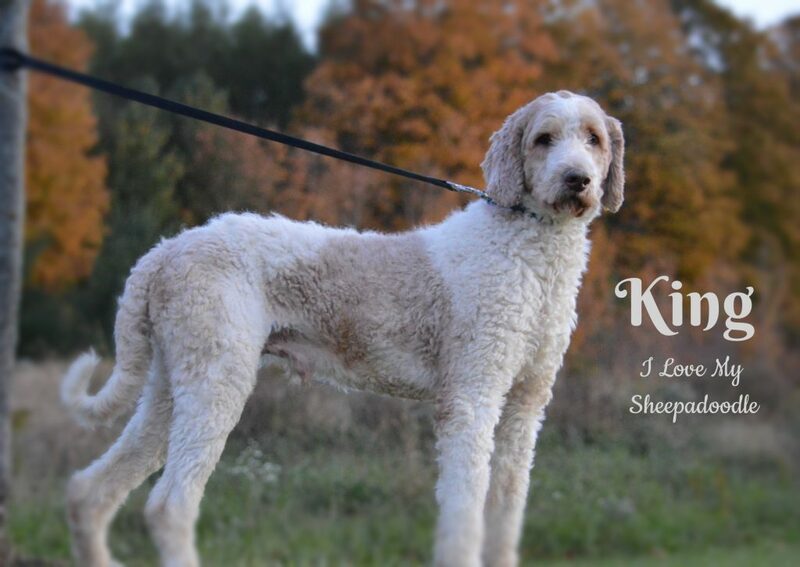 We look forward to some beautiful Sheepadoodles from King’s lines! Tobi is such a sweet boy! His name says it all! He plays dress up and lets my kids take him along with them wherever they go. He also has his pass to the local nursing home where he can bring some more smiles. Tobi loves life and brings joy to those he meets. Tobi is 13.5 inches high and 16 lbs. He has passed his OFA prelims with Good hips and normal elbows. Tobi is registered with the Canadian Kennel Club. He is a lovely boy and produces beautiful pups inside and out! 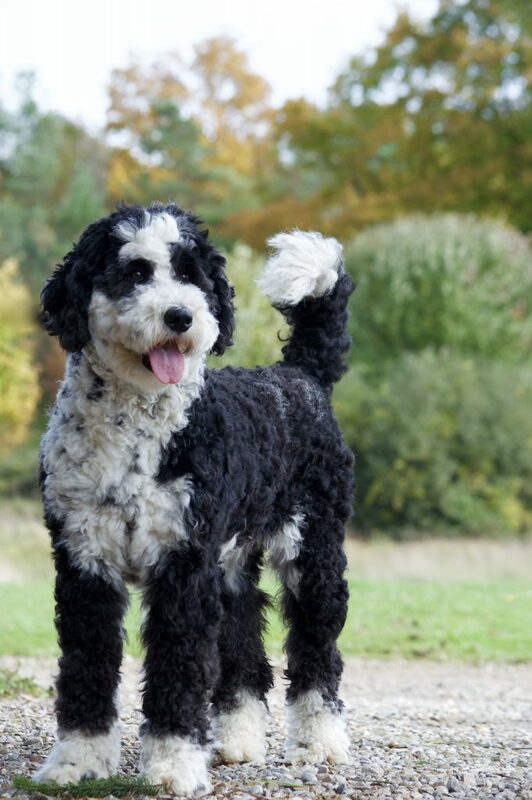 He will be father to our Moyen, Mini and Tiny Sheepadoodle pups! Chloes has a quiet and gentle nature with thick soft fur! Chloe has a nice boxy build. She is around 70 -75 lbs. She is a sweet girl and is a favourite among us. She can throw tri-colored Sheepadoodles as well as black and white Sheepadoodles. Some have held their black and white colour but most will have a beautiful grey and white coat in their adult hood. Look at Wrigley below – he is one of her boys! Chloe’s puppies have lovely temperaments and will capture people with their amazing looks! 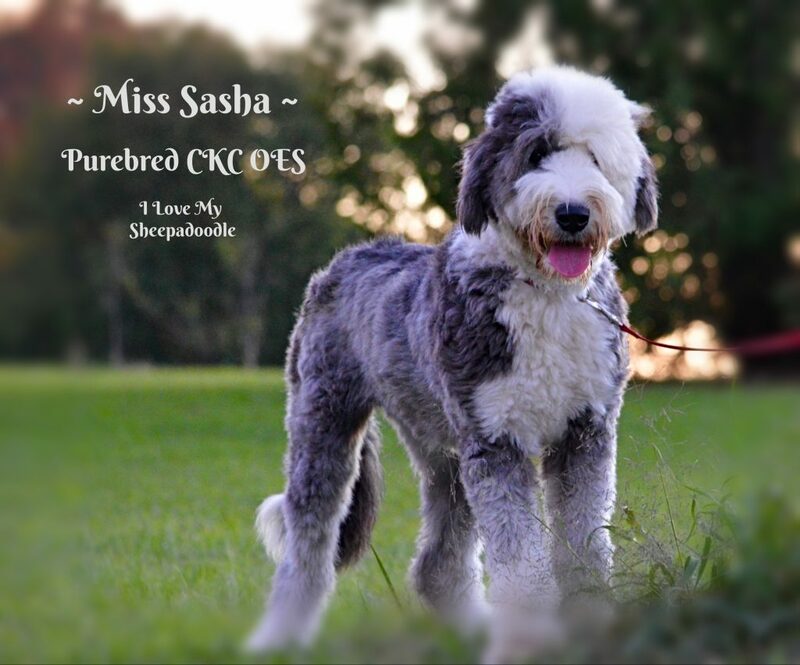 Miss Sasha is our own OES that we produced from I Love My Sheepadoodles. She is playful but also respectful. She has a beautiful blue grey coat that is full and fleecy. She has passed her OFA prelims with Good hips and elbows. We look forward to some Standard F1 Sheepadoodles she will make in 2019! Star is our newest little purebred AKC Old English Sheepdog pup. He is a sweet affectionate boy. He is calm and friendly with low energy. Star has a nice boxy build to him. We are waiting for him to pass his health tests before he starts our program. We hope he will be a Star in our breeding program! He should mature to around 75 lbs. Wrigley is a friendly fellow. He lives with a foster home in the nearby area where he gets lots of love and attention. He has turned out to be quite the gentleman! He sure is a charmer with his good looks and playful but gentle spirit. He has a thick soft coat ~ it is irresistibly huggable! Wrigley has matured to 41 pounds. 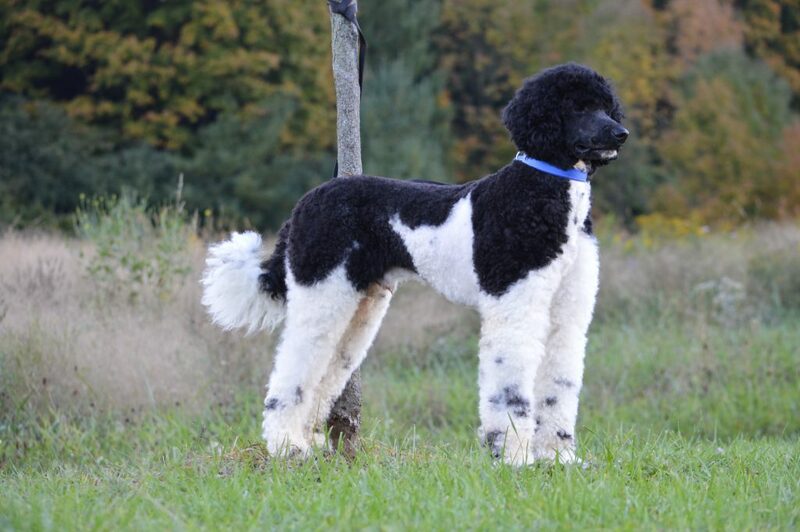 He is going to be a wonderful stud to our Poodles for Moyen Sheepadooles. We are so excited to see the pups he produces! Watch for Fall 2017 for his first pups! Phoebe has matured into a beautiful young lady! She is sweet and easy going in nature. She has a lovely dark grey coat with a soft gentle wave. She has matured to 29 pounds. Phoebe loves living with her foster family and they love her!! We look forward to seeing her puppies arrive Fall of 2017. She will be bringing us our first litters of Tiny Sheepadoodles. What a lovely lady you have become Phoebe! Abby is our most petite Mini Sheepadoodle. She weighs in at 26 lbs. She has a curlier coat yet it still has a gentle wave to it as it grows out. She has a quiet nature and is loyal to those she loves. She’s a smart little cookie too! She has been a blessing to her foster family as they have been to her. 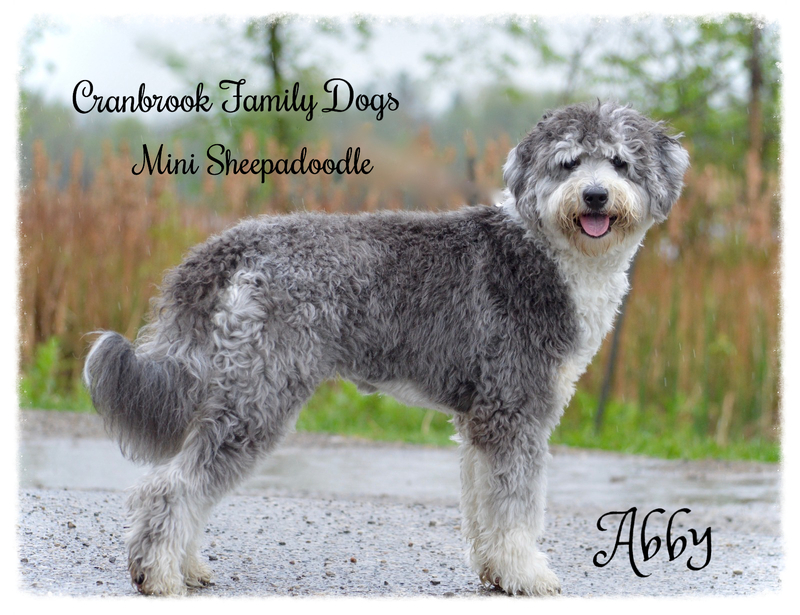 We look forward to Abby’s Tiny Sheepadoodles planned to arrive Fall of 2017.